Large number of artistes, writers, journalists and folk dancers from all parts of the Trincomalee district attended the event held at Trincomalee New Silver Star Restaurant. Mr.Puthuvai Ratnathurai addressing the gathering said Tamils in Trincomalee district are not showing any interest in developing their fine arts as in past. Trincomalee Tamils several years ago excelled in arts and cultural activities. Trincomalee produced the first Tamil film music director in the country. A Trincomalee Tamil scholar wrote the first Tamil novel in Sri Lanka more than hundred years ago. "It is a pity to note that the present Trincomalee has become a cultural desert without any forward movement in the cultural sphere. This pathetic situation should not be allowed to continue any more. Scholars, artists and creative writers of the soil should rise again for the revival of cultural activities in Trincomalee once more. 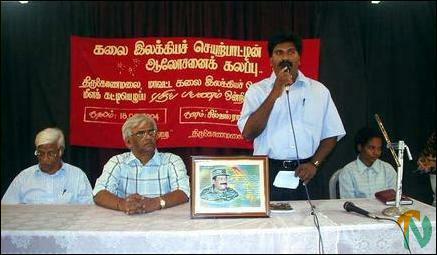 The LTTE leadership is prepared to render all necessary assistance in this regard", said Poet Puthuvai Ratnathurai. Mr.Elilan and Ms Kaaronja, LTTE Trincomalee district women political wing head also spoke. 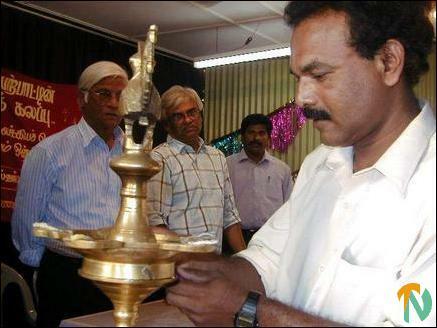 Several artists and writers extended their co-operation for the revival of Tamil cultural activities in Trincomalee.